Her daughters have vanished. Her husband's wanted for murder. Her past is a fabrication. Is there anything in Claire Taylor's life that isn't a lie? "No one writes crime fiction quite like Declan Hughes..."
"Hughes is simply the best Irish crime novelist of his generation." 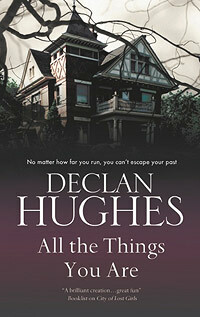 "Declan Hughes isn't just another gruff voice in the barking crowd of noir crime writers ... this gifted Irish writer's characters have depth, his scenes have drama, and his sentences have grace. The characters who count are substantial figures with considerable heart." "Hughes' prose is lush, rich with detail, peppered with historical and literary references ... Hughes is not only a novelist but also a veteran playwright ... and reading his novels is not unlike watching an epic movie unfold on the big screen ... The suspense is irresistible. The writing is superb, at times bordering on poetry. And the characters are superbly drawn—so real that you could almost shoot them yourself." "Breathtaking ... How does Hughes keep it fresh? By the sheer exuberance of his prose ... And mostly by the high respect he has for mystery. Hughes pays subltle, effective tribute to the old-time mystery tradition of lining up suspects one by one, but it's mystery of a deeper kind that underlies the story ... Did Ross Macdonald's novels have an undertone of romanticism? Hughes's have an entire orchestra, and he has the writing chops to pull it off." Site design © & maintenance by xuni.com. Header photograph © James Fennell. All content © 2009-2019, Declan Hughes.